I am so incredibly behind with anything, gosh. I meant to post this..uhm.. 5 days prior to this day but guess what? Not only did I get flooded with early shifts at work that usually leave me ghostly apathic and sleeping at 7PM already, but on top of that the keyboard of my laptop broke (the t and e keys are not working.... which is totally fun for any language I'm communicating in.) It worked okay-ish until I had to submit my thesis but since then, it takes ages for me to finish a sentence with this keyboard. But enough of my problems - let's venture right into a brighter horizon, shall we? 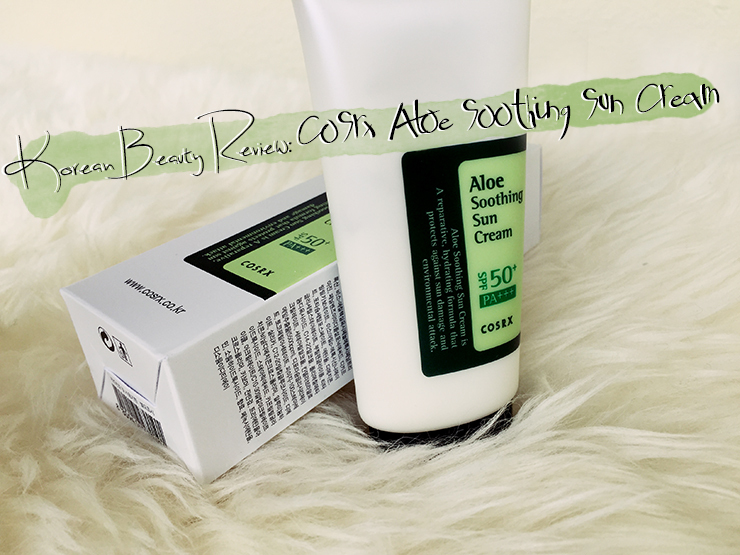 With the recent heat wave that we had in Germany, there were perfect testing conditions for my newest addition to the COSRX family, the Aloe Soothing Sun Cream. I kindly received this from Jolse upon my request and am happy to share this review with you today! 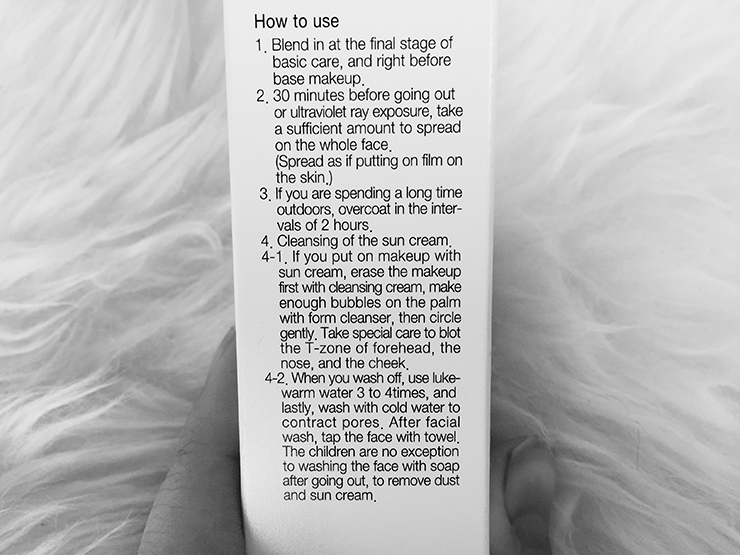 This is the only sunscreen by COSRX so far and I have been surprised that there were almost no reviews (until recently, when Picoprince reviewed this on his blog as well) despite it's very appealing name. 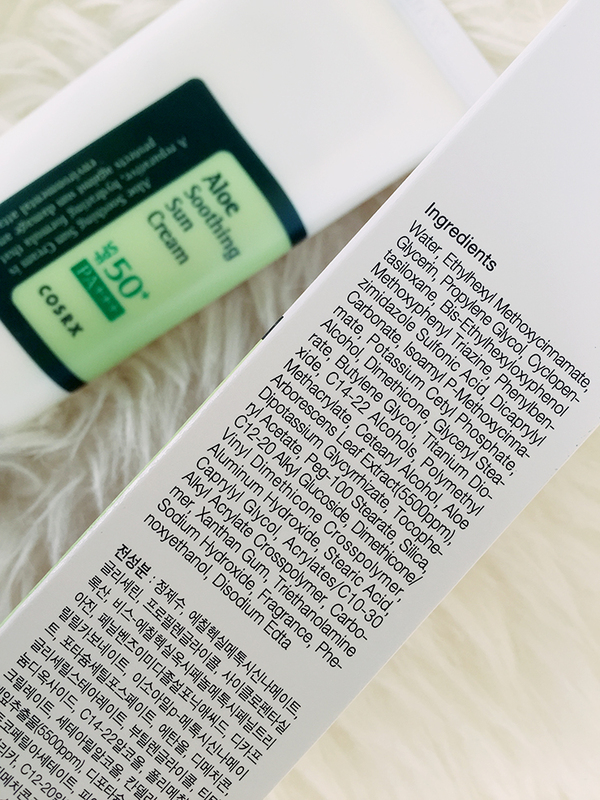 Or maybe that is just me but the keywords "aloe" and "soothing" just seem to scream out my name. If you constantly battle acne like I do, those words develop an inner calling that is very hard to resist! ....I typed out all the ingredients just to remember that I took a picture of said ingredient list before I threw the packaging out. Well. Now you have both. Extra point for thoroughness, anyone....? ....I really always appreciate COSRX' thorough explanations on how to use their products the correct way, especially for their products that contain acids. This sunscreen comes in the standard (too tiny) 50ml plastic squeeze tube and I am just praying for the day when some marketing expert suggests bigger bottles so we don't have to constantly repurchase tiny sunscreen bottles. The day will come, I am certain of that! Maybe. Please....? 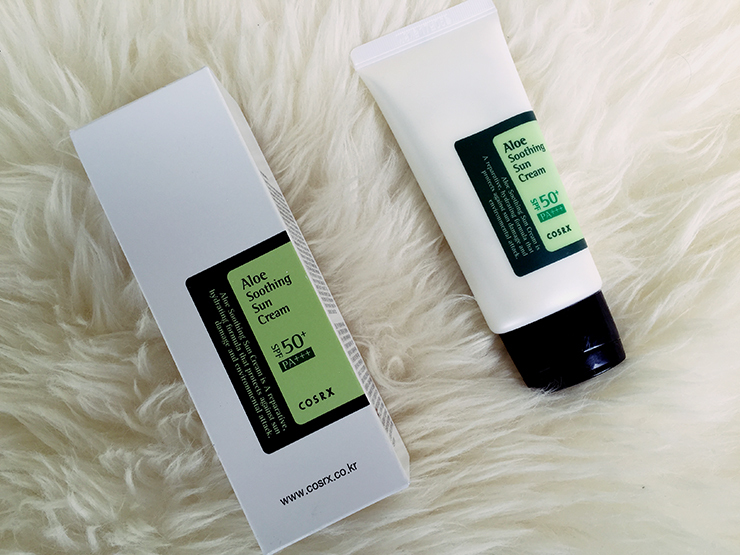 The packaging is simple and quite non-exciting as all products from COSRX; I love the fresh green accents though as green is my favorite color. 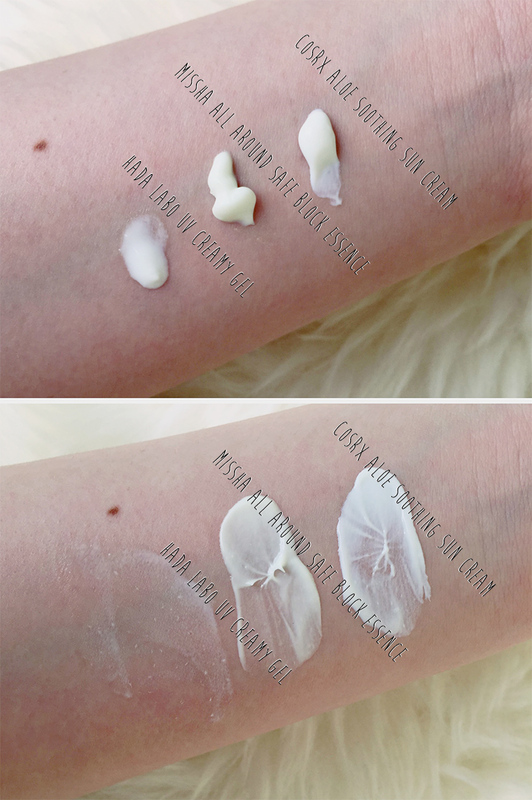 This sunscreen has quite a thick texture that initially bummed me out a bit because I am just so in love with the watery feeling of the Hada Labo UV Creamy Gel. However, this sunscreen applies like a dream nonetheless: It is easy to spread, leaves no white cast and doesn't feel overly greasy on the skin. 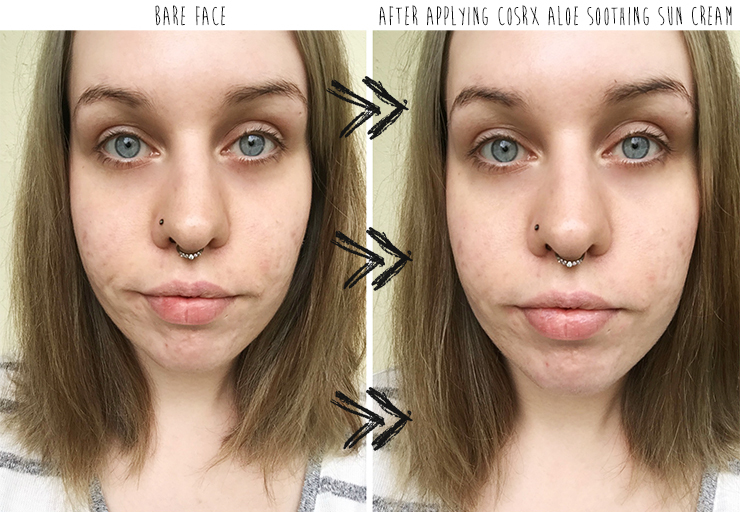 (Note: I am ghostly pale so I think there could be a slight white cast if you have a deeper skin tone that I do - let me know if you experienced any so I can update this post on it!) It is not as thick as the Missha All Around Safe Block Essence (pink tube) though, which is my least favorite sunscreen but more on that topic soon when I'll publish my big sunscreen comparison post. Sleep-deprived zombie face because I just came out of a week of deadly morning shifts. My skin is obviously not in a happy place right now. ....can you spot the huge difference in those pictures? No? Because there is none! Except that I slathered a big spoon of the sun cream on my face but it barely shows which I honestly didn't expect upon seeing the thick texture out of the bottle initially. There is a slight shine on the face visible when I turn my head in all directions in front of the mirror but it's nothing that a little bit of powder won't fix. The best part? This totally did not break me out! 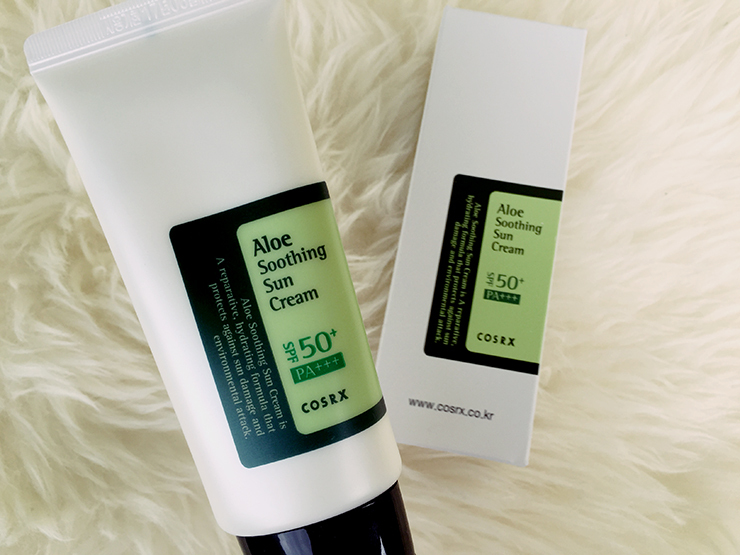 COSRX, you will forever have a special place in my heart as my skin just loves you so. Also, while this was not as soothing as my favorite snail essence (one can dream, right?) I found this sunscreen quite moisturizing/soothing (for a sunscreen at least.) 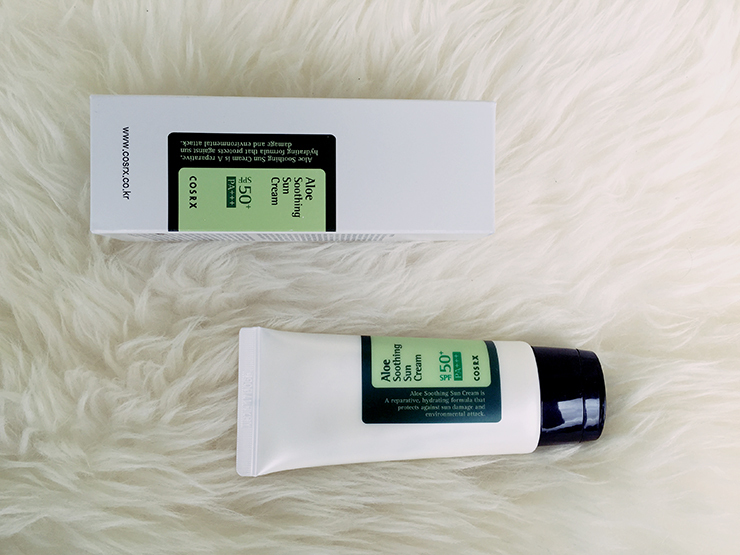 I definitely looked forward to use this in my routine when I ran out of my beloved Hada Labo UV Creamy Gel as it was a good alternative for me. If you are still searching for a gentle sunscreen and don't mind a thicker texture I would definitely recommend you give this a try! 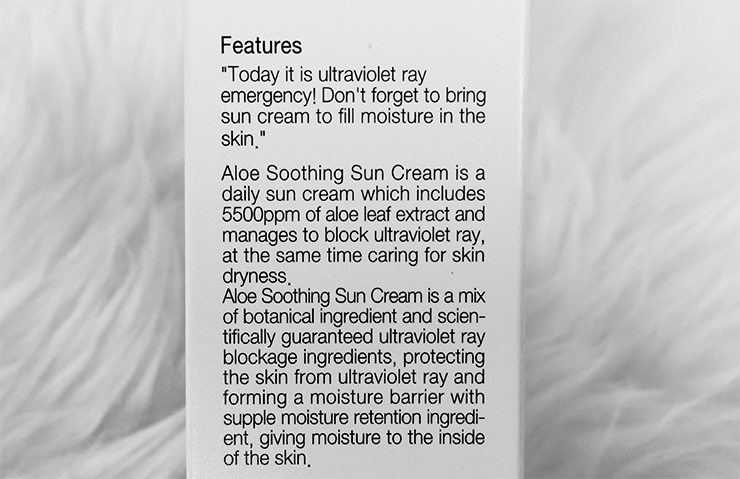 You can get the COSRX Aloe Soothing Sun Cream at Jolse for 14.98 or 13.41€ + free shipping on Ebay! Disclosure: Jolse has been so nice to send me this product for review purposes. 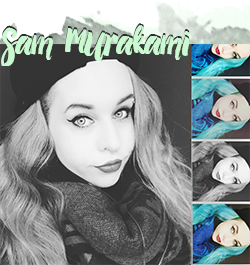 All pictures have been made by myself and my opinion stated are my own & honest words and have not been influenced by a third party. - see my full disclosure and review policy here.